‘Bodalla’ (the name is possibly a corruption of ‘boat alley’) is a dairying and timber town 42 m above sea level and 329 km south of Sydney via the Princes Highway. It is thought to have been originally inhabited by the Dhurga Aborigines. George Bass was the first European in the district when he anchored a mile south of Tuross Heads at Marka Point in 1797. He circumnavigated Tuross Lake searching for fresh water but found none. After moving sheep into his squatter’s run at Bergalia John Hawdon transferred his cattle south from Bergalia to Bodalla and commenced dairying in 1834. Alexander Weatherhead and his family moved to the site to manage the enterprise. Weatherhead’s wife had a son in 1837, the first white child to be born in the area. Until 1848 land in the area was only available in the form of pastoral leases. That year it became available for purchase and by 1856 most of the area had been subdivided into 32 dairy farms. In 1857 T.S. Mort purchased property at nearby Comerang and built a mansion there, designed by noted architect Edmund Blacket. It became known as the ‘home farm’. A man called Parkinson had laid out a village c.1850-51, to the west of present-day Bodalla, which had to be moved later when the road was realigned. Mort, who had made a fortune as an innovative auctioneer, wool-broker, pastoral financier and land speculator, saw potential in the village. He rebuilt the village to stand as a model of land usage and as an ideal integrated rural settlement occupied by tenant farmers. He had the beef cattle removed, set up cheese and butter-manufacturing equipment and milking sheds, drained the swamps, cleared the land, had imported grasses sown, erected fences and personally chose the tenants. The experiment did not work and in the early 1870s full control returned to Mort who, this time, divided the property into three farms, used hired, specialized labour, upgraded the facilities and implemented new methods of dairy management, stock breeding and cheese production, involving the mixing of milk from the different breeds and farms. The effort was rewarded with higher quality produce if not financial success. 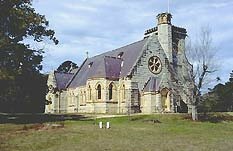 Mort died at Bodalla in 1878 and his tombstone and vault, also designed by Blacket, lies in Bodalla cemetery on the road from Bodalla to Eurobodalla. After Mort’s death the family formed the Bodalla Co., to run the property. They sold off the subdivided farms in 1923 and the village properties in 1926. Thomas Mort died before he could realise his plan to build a church for the Bodalla community, services being held behind the Bodalla Arms Hotel (1875). Thus his family built All Saints Anglican Church as a memorial to Mort and his first wife Theresa. His second wife laid the foundation stone in 1880. It was designed, again by Edmund Blacket in Gothic Revival style and bears a memorial tablet. The minister was Rev. W.H. Walsh, Blacket’s earliest patron, who came to Bodalla to retire and served as virtual private chaplain to the Mort family. The church was built of grey granite quarried on the estate. It features a large tower and spire at the south-west corner, a large rose window at the west end, oak woodwork and furnishings and a pipe organ from England. Although Blacket planned the interior of the Bodalla tower, with its elaborately tiled floor and stained-glass windows ordered from England, he died in 1883 and Cyril Blacket erected the tower in 1901 making a dubious departure from Edmund’s plans for the exterior. 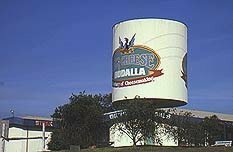 As you enter Bodalla from the north you will find, on your left, The Big Cheese, a tourist complex offering cheese and honey sales, a modest luncheon, a gift shop and an ice-cream parlour. Be warned: the cheese is not cheap. If you take the Eurobodalla Road out of town you will find, near the first bend, Bodalla Public School where the old school (1877) is the current residence of the headmaster. James Badgery was the first to establish a station in the Eurobodalla district in the late 1830s. The township was developed after the Land Act of 1861 opened the area to free selection, becoming the site of the first public school in the district (1864). One of the largest selectors was poet, literary critic and political commentator Charles Harpur who moved to Euroma near the Tuross River in 1866. The Nerrigundah Mountain Road heads west out of Eurobodalla and leads to Nerrigundah. It becomes unsealed after about 6 km. After the strike at Mt Dromedary in 1860 prospectors found gold at Gulph Creek precipitating a rush at Nerrigundah in 1861. Amenities, and dredges, began to appear and the town was surveyed in 1867. At its height the site was alleged to have 2000 inhabitants, including many Chinese, who had, at their disposal, five hotels and several shops, including one for the Chinese residents, as well as a police station and courthouse. However, the population began to dwindle with the gold at the end of the century. Sawmilling saw a faint revival of the village in the 1950s but little remains today. The large monument in town is associated with the Clarke bushranging gang. On Sunday, April 8, 1866 the gang took over a hut beside Deep Creek, just south of Nerrigundah, and held up the passers by. Among them was Moruyah storekeeper, John Emmott, who was riding home with his dealings. The gang shot his horse from under him, robbed him of the small fortune in his possession, shot him in the thigh and hit him on the head with a pistol. Not satisfied with their gains and perhaps fueled by the ease of their pickings five of the gang rode into Nerrigundah and held up the diggers at the hotel. Two more entered Pollock’s Store, now a museum with local information. The owner, one of the main gold purchasers, was forced to furnish the key to his safe. However, while the gang were herding more of victims into the hotel Mrs Pollock snatched the safe key from Thomas Clarke and threw it across the street, where one of her children clinched it between his toes and walked off with it. A candlelight search in the gloam by Clarke proved fruitless. Trooper Miles O’Grady and another trooper entered the hotel just as two of the gang were threatening to kill local butcher, Robert Drew, who had thrown a roll of notes over their heads behind the bar. O’Grady fired at the two men, narrowly missing Patrick O’Connell but killing William Fletcher, a young jockey and son of a prosperous Batemans Bay farmer, who had only joined the gang the previous day. O’Grady was then shot through the heart in the return fire from William Clarke. The gang then fled town, picked up the other gang members from their base on Deep Creek and journeyed north. Sergeant Hitch, the officer in charge of the Nerrigundah police returned from Moruya and organised a twelve-man posse. They ambushed the gang at Eucumbene River but no-one was captured, the only victim being a pack horse laden with goods from the store. They were officially declared outlaws the following month. On the 100th anniversary of O’Grady’s death in 1966 the Wild Colonial Days Society issued a commemorative brochure and re-enacted the event before a crowd of 3000, significantly more people than the town had ever held, even in its heyday. The monument in town is in honour of O’Grady who was buried in Moruya cemetery. However, it is incorrect that he fought the gang single-handedly as the monument claims. Fletcher’s grave, which was allegedly wrapped in bark, was laid and can still be found outside of the Nerrigundah cemetery, about 25 metres from the back right-hand corner. The cemetery itself is behind a grove of wattle trees a hundred metres beyond the monument and slightly to its right. The Bodalla sector is serviced by a single unit officer who resides in the residence at Bodalla. The area patrolled by this officer includes areas as far north as Coila, south to Brou Lake, west to Belowra and of course to the east coast. From these boundaries the area also covers numerous towns including Tuross Heads, Turlinjah, Bodalla, Nerrigundah and Potato Point. It is believed the total permanent population serviced would exceed 3000. However, like all other coastal areas this total would almost double during summer months and during most holiday periods. Bodalla like other areas of the South Coast is highly culturally diverse. There still seems to be some misconception about contacting local police. If there is an emergency which requires police attendance, ring 000. If you wish to speak with local police and it is not an emergency but requires their attendance, ring the local police station. If unattended, your call will be diverted to Warilla. Inform Warilla of the situation and they will direct local police to you. If it is not an emergency and does not require police attendance, leave a message and local police will return your call. If you attend the local police station and police are absent, then you can contact Warilla by using the door phone at the front of the station and police will be directed to you.